The Jackal Treat sold by Drojkor where you earn your jackal says that it requires the completion of the Skimmer Search collection to unlock it. I have the Skimmer Search collection completed and it is not unlocked. I was initially coming to report this as a bug for my account, but checking the wiki shows that others have noticed this item stating the wrong collection requirement as well and that it is supposed to state that it requires the completion of the Jackal Reconnaissance collection. Apparently it is just that someone put the wrong collection requirement on the item and not that my account is bugged (thankfully). Please correct this item to reference the proper collection as needing to be completed to unlock it to prevent further confusion to future players. Fixed the Jackal Reconnaissance achievement so it will no longer stall if the player recovers Awakened intel before turning in a letter to Nori Mahat in the Bonestrand. I'm sorry to see you were left confused by this bug months after my report - something that could have been prevented had it been corrected back in November while they were already in there fixing another aspect of the achievement. Apparently they do not do things too efficiently and correct any errors involving the same item or location at the same time and instead follow a prioritization list. It appears to only be a visual error in the pop-up information, so it should be as simple as replacing the target value on the info pop-up UI element script to that of the correct collection and not something more complex that would take a few more minutes. I expect that it would literally takes mere seconds to query the proper value of the Jackal Reconnaissance collection and replace the incorrectly targeted Skimmer value on the info pop-up with it. As this is not 'game breaking' and likely marked as being very low priority, and considering how long PoF has been released with it still not corrected, it is unlikely to be corrected any time soon. We could be surprised and see it corrected in the next patch, or perhaps not for a few years or never. It is just disappointing that some players starting their Jackal unlock journey might continue to be confused by this for an unknown amount of time. Bump -- been a while. It is still broken. Blocking progress. Bug still persistent. Progress blocked. I've got the letters to deliver which was done but, of course, it didn't counted due to the wrong requirement listed. I have Skimmer Search finished which is a requirement to unlock the Jackal Treat as well as finish the Drojkor, Spirit Squall heart but he did not give me a Jackal Treat it is still greyed out and is still showing that I need to finish the Skimmer Search achievement still. 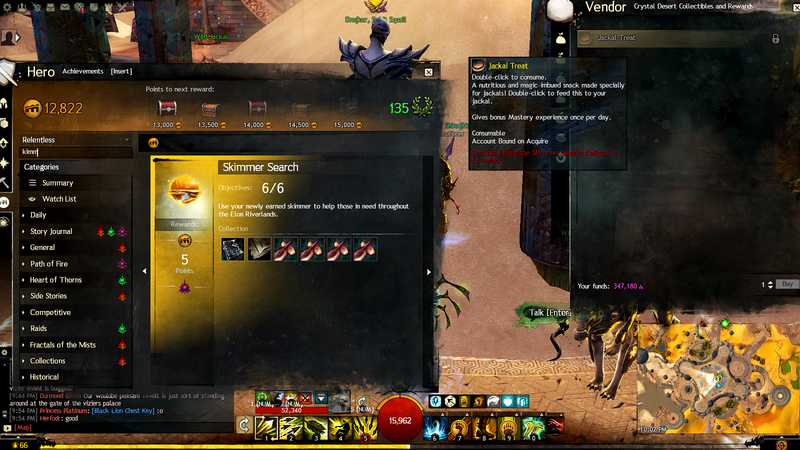 I am going to go get all the items for the https://wiki.guildwars2.com/wiki/Jackal_Reconnaissance and see what happens. Shrug. EDIT: ok you have to talk with him after you finish the heart. The question will be above the karma triangle. Then he will give you the Jackal Treat you need for the Jackal Reconnaissance Achievement. [img]https://i.imgur.com/P9H2Wy8.jpg[/img] They do need to change the Unlock for this treat! Well over a year after Path of Fire's release and over a year since I reported this issue and something that would literally take mere seconds to correct has still not been fixed...and it continues to cause players to be confused and potentially frustrated due to wasting time and energy trying to figure out what is wrong when it is no fault of their own. Jan 8th update and still no fix for this, please someone !! I only pay/play for fun, and bugs stop the fun!